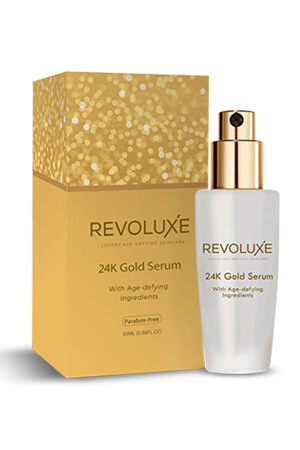 By buying the Special Trial of our Revoluxe 24K Gold Serum, you will pay only for shipping and handling upon placing the order. You will then have 14 days, after processing and delivery time, to try our products. If you are not 100% satisfied for whatever reason, simply contact us to arrange the return of product to us. If you choose to keep the bottle, you will be charged the full cost of €149.98. The charge will appear on your statement as Rejuvegold.com REJUVEGOLD.COM+442031501128. A €1.75 restocking fee is applicable to all returns. 1 AutoRefill Program: when you enrol in our AutoRefill Program, we will automatically send you a replenishment of the products you have ordered according to our common replenishment guidelines (normally, every 30 calendar days starting 30 days after the first full charge following the trial period.). Your card will be charged €99.98 accordingly upon dispatch of the replenishment package. AutoRefill can be cancelled at any time by simply logging into your account. © 2016 Erterei Ltd, Krizikova 213/44, Karlin, 186 00 Prague, The Czech Republic. Company registration #02136929. All rights reserved.